Ghana’s Supreme Court was recently called upon to interpret and enforce the Constitution in a matter involving the constitutionality of the process for admission to the Ghana School of Law in the case of Professor Stephen KwakuAsare v Attorney-General and General Legal Council. 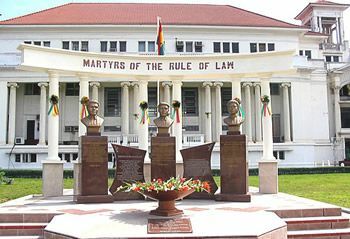 The plaintiff challenged the constitutionality of the requirements that a student passes an entrance exam and interview to gain admission to the Ghana School of Law. He argued, inter alia, that those requirements should have been contained in a legislative instrument and subsequently laid before Parliament pursuant to article 11(7) of the 1992 Constitutions. The Supreme Court agreed with the plaintiff’s argument and declared the requirement unconstitutional. It, however, decided in effect that the judgement would not apply retrospectively and will not affect those who student who shall write the exam in July. Consequently, some students may have to undergo this unconstitutional process. This order was given with the consequences of invalidation of the admission process in mind.Students of constitutional law have however debated this judgement with critics arguing that the Supreme Court which has the duty to enforce the constitution is allowing the violation of the Constitution. The relevant legal question, however, is whether or not the Supreme Court is under a constitutional or other legal obligation to invalidate acts or enactments that it declares unconstitutional? We must be clear that the question is purely legal. The question may be answered in the negative, whilst maintaining that it is not prudent, moral, or just for the Supreme Court to. Also, article 1(2) has been extended to international business agreements by analogical reasoning though, strictly speaking, they are not laws. Date-Bah JSC in Faroe Atlantic v Attorney-General stated: “Thus, if even statute law is void, if in conflict with the Constitution, a fortiori, contracts breaching the Constitution should not be enforced.” Also, it is noteworthy that in any case article 181(2) makes contracts not complying with 181 unenforceable. 2(2) The Supreme Court shall, for the purposes of a declaration under clause (1) of this article, make such orders and give such directions as it may consider appropriate for giving effect, or enabling effect to be given, to the declaration so made. 2. The Supreme Court can choose to either make an order to give effect to its declaration or to make an order that will enable effect to be given or both. Thus it is clear that there is no obligation to invalidate which is necessarily an order to give effect to the constitution. 3. The Supreme Court is not bound to give any order, but only such orders as it deems appropriate. Thus there is no obligation to invalidate where the Supreme Court does not consider it appropriate. It is noteworthy that article 1(2) is not the only provision that determines the effect of unconstitutionality. Article 266(2) provides that, “An agreement, deed or conveyance of whatever nature, which seeks, contrary to clause (1) of this article, to confer on a person who is not a citizen of Ghana any freehold interest in, or rights over, any land is void.” Article 3(6) is also clear that the punishment given to persons who resist the overthrow of the constitution is void. It thus appears that in the cases where the Constitution does not determine the effect of unconstitutionality article 2(2) is applicable. “No person can make lawful what the Constitution says is unlawful. No person can make unlawful what the Constitution says is lawful. The conduct must conform to due process of law as laid down in the fundamental law of the land or it is unlawful and invalid.” The position of Justice Sowah will thus suggest that every unconstitutional act and not just an enactment should result in invalidation. However, the majority comprising Atuguba, Adinyira, Baffoe-Bonnie, Gbadegbe, Akoto-Bamfo JJSC did not agree. They considered the possible effect of the invalidation of the votes on the enjoyment of the right to vote and thus did not consider it an appropriate remedy. In the very recent case of the Supreme Court unanimously appeared to take the approach of the majority in the Election Petition case. It is interesting to note that Dotse, Yeboah, Gbadegbe, Bamfo, and Baffoe-Bonnie JJSC who decided this had different views in the Election Petition Case. In the long run, the Professor Stephen KwakuAsare v Attorney-General and General Legal Council is not necessarily beneficial to students. Contrary to public opinion the Supreme Court never said it will be unconstitutional to require students to pass an entrance exam and interview. They were of the view that such requirement must come by way of legislative instrument. Since Article 11(7) requires legislative instruments to be approved by parliament failure to do so made the imposition of those requirements unconstitutional. The court left it to the General Legal Council to decide if it will specify alternative places of instruction or not. That relief in my view was most important to students since it would have created more space for qualified students. The fate of students appears to be in the hands of students. It requires a coordinated effort from law student associations and other student bodies. This way, we may petition Parliament to reject any LI that does not cater adequately for students. Secondly, Parliament may amend the Legal Profession Act, (Act 32) to create more space. This may be done by mandating the GLC to grant licenses to educational institutions which meet certain requirements, or by directly empowering those institutions to teach the courses. The General Legal Council, on the other hand, may be quick to specify other places of instruction.